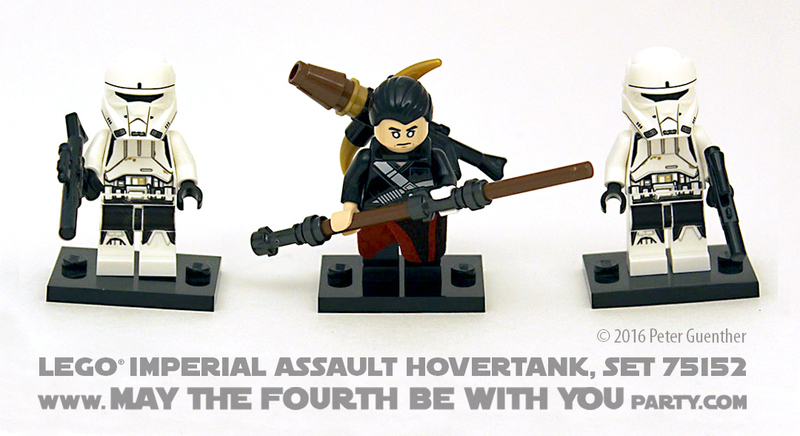 The set comes with three minifigs: Chirrut Îmwe and two identical Imperial Hovertank Pilots. Îmwe’s head is printed on both sides, one face determined and the other with a lopsided smile; he comes with a staff and a bowcaster-like weapon. The pilot helmet is a new mold, styled accurately to what we see in the first Rogue One trailer. One pilot comes with a short blaster, the other with a regular-length pistol blaster; with a rifle blaster mounted on top of the hovertank, all three LEGO® blasters are represented in this set. All three minifigs have very detailed printing which is the standard LEGO® style these days. The set includes a crew compartment with a flip-open top. A hatch is represented on the sloping front but does not open; similarly, the circular hatch on top doesn’t move but a larger trapdoor hinges open. There is a lower spot in the compartment for the driver; the second pilot can be seated behind and above him if the top hatch is left open. The set includes one orange cargo container for Rebels to steal, with space for an additional one; the first full trailer shows three on the back of a hovertank, so the scale is a little bit off here. Still, it’s a good play feature; the top of the container lifts off, revealing a small storage area to fit a blaster or two. Assembled, the set is sturdy and rolls well on clear wheels. Each side has a small gear which can be turned to spring-launch a trans-red bolt; additional blasters on the side can be rotated up and down, but without a main gun this feels more like an armored hover-pickup-truck than a tank. 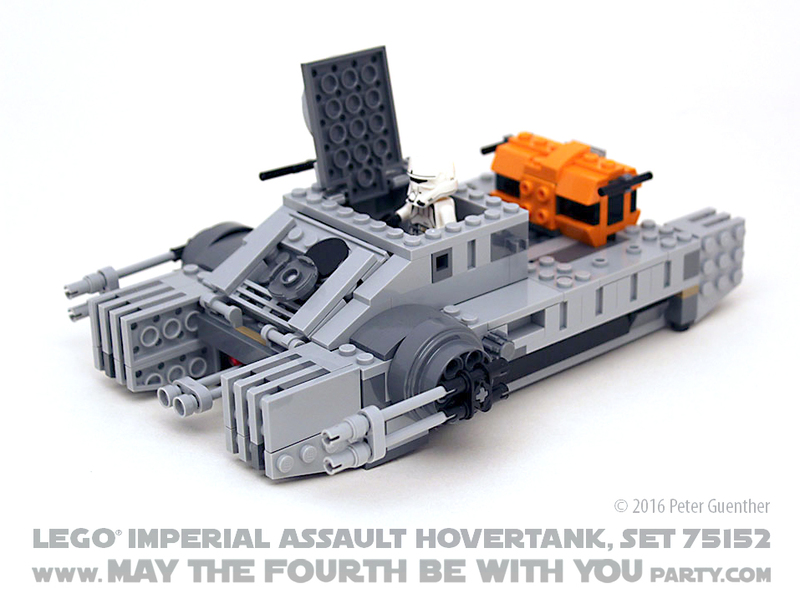 Playability: This set has a lot of playability: side blasters can be rotated, spring-loaded bolts launched, the top gun angled and the top hatch opened. The set rolls well and the cargo container nestles securely but is also easily removable. With a Rebel included in the set to take on the Imperials there are lots of play possibilities. Accuracy: The Hovertank is seen briefly in a couple of spots in the original Rogue One trailer; while the containers aren’t exactly in scale and the hatches don’t themselves open, the tank, the pilots, and Îmwe all appear accurate to their trailer appearances. 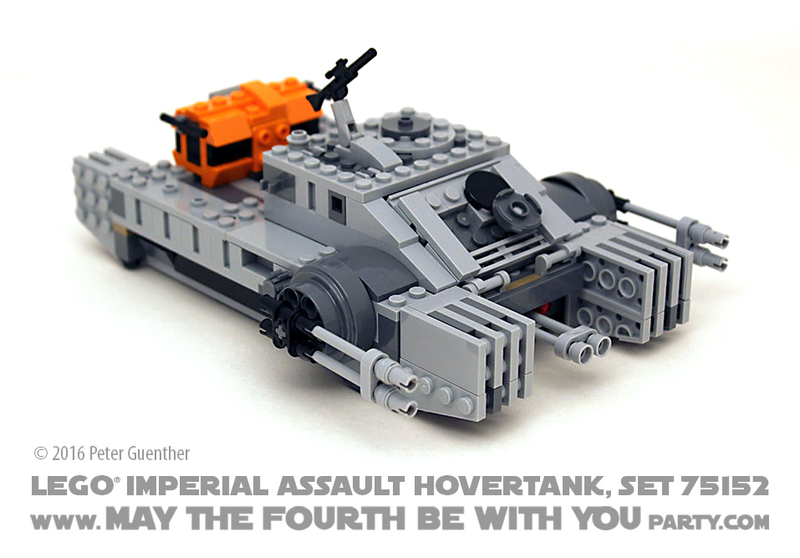 Challenge: The Imperial Assault Hovertank is a straightforward build and mostly mirrored, although the hidden spring shooter buttons add a little interest to the process. Value: 385 pieces for $30 is an excellent value for any LEGO® set, particularly Star Wars. As the only source of Chirrut Îmwe currently and also boasting two of the new Hovertank Pilot minifigs with their new helmet, this set is definitely worth picking up.